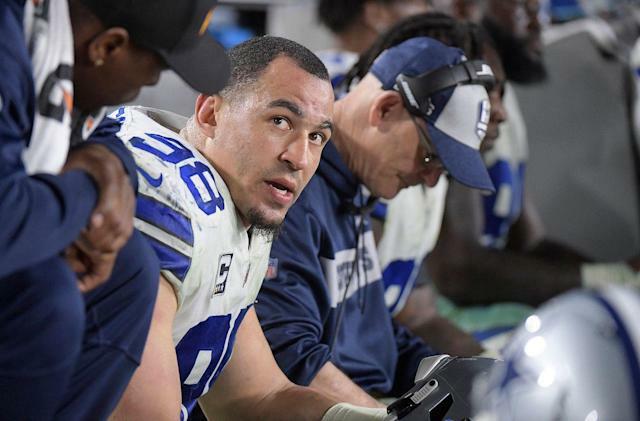 Dallas Cowboys lineman Tyrone Crawford shoved a police officer during an incident at a bar Friday. Crawford was not arrested, but can be seen on video shoving the officer. Video obtained by 105.3 The Fan shows Crawford pushing his way through a crowd before he gets to the police officer. The incident took place at the Coyote Ugly bar in Panama City. According to The Fan, the uniforms worn by officers in the video match what Panama City police would wear. The Fan also believes the person in the red shirt is a security guard who works at Coyote Ugly. The 29-year-old Crawford was detained by police, but not arrested, for his role in the incident. Given that, it’s tough to know whether Crawford will face punishment from the NFL. The league is currently looking into the incident, according to ESPN’s Todd Archer and Dan Graziano, but without knowing what took place before Crawford shoved the officer, it would be tough to come to a definitive conclusion. The Cowboys and Crawford have not commented on the incident.